Patch 182.0 introduced the possibility of taming dinosaurs without knocking them out. 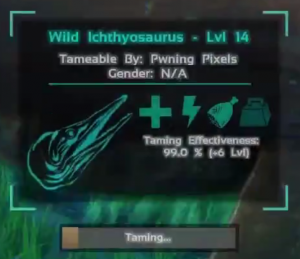 This is interesting even for those with an inclination to violence, because it allows you to get better dinos. Specifically, it has a higher taming effectiveness. So the base level and stats of your dino will be improved compared to the current method. Note that this currently only works for the Ichthyosaurus. The idea behind it is simple enough: Feed a Dino when he’s hungry, and he’ll be your loyal friend. In practice it’s a bit more difficult though. First of all, you’ll need to put meat into Slot 0 (it’s important to use the correct slot) in your Inventory. That’s the rightmost slot in your hotbar. You can then feed the Dino by interacting with him or her (clicking “E”). You’ll have to do that every time it’s hungry in order to succeed at your enterprise. If you’re unsure whether the taming started successfully, you simply need to hover over the animal and see whether the taming bar is present in the info-text. As soon as you’ve started the taming process the dino will conveniently approach you when it’s hungry. Rinse and repeat until the taming bar is full. Be prepared. It may very well be that you’ll have to spend significant amounts of time under water or near the surface, so it’s best to stay near the surface. Leaving the dino alone for prolonged amounts of time will rapidly lose you taming process, so be sure to pack everything you need (this includes obscene amounts of meat) beforehand. If possible, get a friend to help you. He/She can supply you with the necessary meat while you don’t have to leave the dino alone. they seem to run away after 1/3 taming, need to give chase, so bring a water mount to keep up, or trap it in a water pen.